How to Insert Emoji, Special Characters and Symbols in Blogger? Nowadays its a trend going to use emojis to share feelings. People use to add emojis in every particular message to express their feelings while typing that message. Sometimes, a blogger also realizes to express his/her feelings through emojis while writing a blog post. Blogger platform provides such a great option by default in Post-Editor. You can use special characters, emojis, and symbols directly from your Blogger Post-Editor. Not only that, you can also draw special symbols through your mouse and get the perfect match of that specific character. 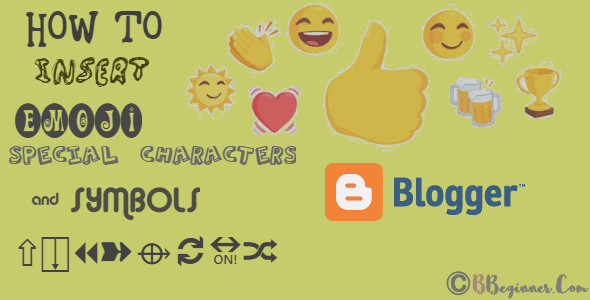 You can use the Blogger "Insert special character" tool to insert arrows (↑→), mathematical symbols (⺟∫), accented (éü) or non-Latin characters (禁𓁗) and even emoji (🐦✋). So, let's start learning how you can insert emojis and special characters in blogger. You must be aware that emoji were used over 1.7+ billion times on Twitter in just five months of the period in 2003 and the count increases every year. Emojis make us feel good because it refers particularly to the representation of an expression that people use while they’re talking face to face. Talking face to face involves the use of non-verbal tools like facial expression and body language. People use these tools to help each other to convey the message more accurately to receive from someone else. But when people talk online then, they lack all those tools that we used in face to face communication. 😊 So, When someone sends you this ‘😊’ then it’s too easy for receiver’s brain to understand that you’re smiling/happy. How to Use Blogger's Insert Special Characters tool? Just follow the below-given easy steps to insert emoji, special character or symbols in your blogger blog posts. Login to your Blogger.com Dashboard and select your desired blog. 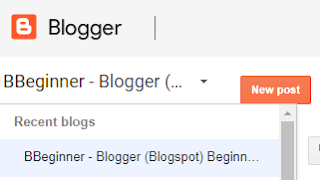 Now Click on New Post option to write a new blog post. Inside the Post Editor, at the left side of “Insert a Video” option, you will find an “Insert Special Characters” option, click on that. Now click on “symbol” option and select there Emoji. You can also add Special Characters or a Symbol from there. You can Search any symbol using symbol's name or use “Draw a Symbol here” to draw a symbol and get the similar list of symbols to use. 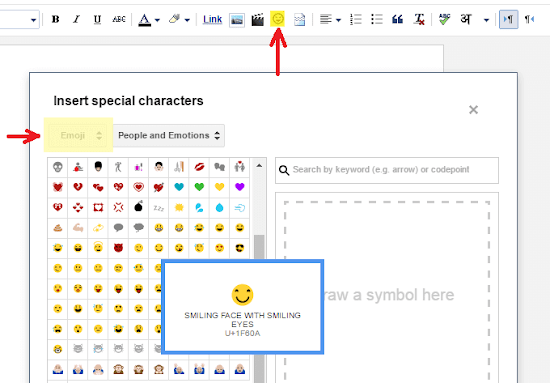 Click on any emoji, special character or symbol to insert in your blog posts. I hope you learnt how to easily insert emojis and special characters in blog posts. It's a great way to share your feelings with your readers while writing a blog post. How to Add Cute Flying Twitter Bird to Blogger Blog? Pls try to add a search widget to this blog for more easy navigation. Thanks for helping us with your information.